Wambora told the committee he will only defend himself at the Court of Appeal. Photo/FILE. 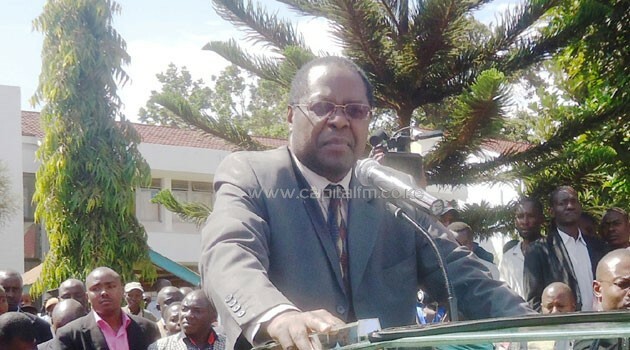 NAIROBI, Kenya May 11 – Embattled Embu Governor Martin Wambora on Sunday declined to participate in the proceedings of the Senate Committee probing his conduct because the same case is pending in court. His Lawyer Wilfred Nyamu told the committee that Wambora had instructed him not to make any more submissions before the committee because his client has filed a case at the Court of Appeal. Wambora’s lawyer had earlier told the Special Senate Committee that the move to oust him is malicious after the initial impeachment was quashed by the court. The Senate Committee Vice-Chairman Kipchumba Murkomen disagreed with the lawyer, saying Wambora is taking them for a ride, because he had requested them on Friday to give him time until Sunday to prepare his defense. “Forgive me for sounding as if I am being rude when I say the Governor was taking us for a ride, by requesting for two more days to prepare and then you come here and tell us that,” Murkomen said. Nyamu had earlier claimed his client did not have sufficient time to prepare his defense before the committee. The Committee has now said it will prepare a report and table it before the Senate on Tuesday, after concluding Sunday’s sittings. “If this Committee finds that the charges have been substantiated pursuant to Senate Standing Order 68 (4 b) then the Governor shall gave the right to be heard again at that sitting. Please inform him to be able and make a decision to attend should that time come,” the committee chairman Boni Khalwale told Wambora’s lawyer. The committee is investigating allegations of gross violations of the Public Procurement and Disposal Act, 2012, and the Constitution, made against him by the Embu County Assembly. Wambora is accused of flouting procurement and disposal rules by among other things ordering the purchase of motor vehicles, procuring maize seeds for plantation and ordering the facelift of Embu stadium without following due procedures.